One of the biggest stumbling blocks in organising an independent ski break is finding a way to manage the section between airport and resort. Austria is perhaps more fortunate than other countries as railway lines – in some case major international rail links – pass through some of the top resorts in the Alps. It is possible, especially during the daytime, to combine trains and buses to reach other resorts which are not listed on this page (see the travel pages for particular resorts for an overview of the nearest railway station and public transport links). These however are the resorts listed on this site with their own railway station and which Ski-Austria thinks should be considered for a ski break by rail. The website for the Austrian rail system is www.oebb.at and, in the winter months, there are sometimes offers which include rail transport and ski lift passes. The railway station in St Anton used to be in the centre of the resort. When the town hosted the World Championships, they moved the rail link across the main road and turned the land freed up into an open area at the heart of the resort. St Anton’s railway station lies on the direct lines to and from Innsbruck, Bregenz and Zürich. Lermoos railway station is situated on the edge of the village on the other side of the through road from the ski lifts. It is a station on the Ausserfern rail service and thus links into the the rest of Austria (and Munich) via a change at Garmisch-Partenkirchen in Germany. In the other direction the line heads to the regional hub at Reutte before going over the border again to Pfronten and Kempten (with links further afield to locations such as Lindau and Ulm). Seefeld is on a direct rail line between Munich and Innsbruck, which makes it a convenient resort for those arriving at either airport. The train station is located in the heart of the town and onward transport to the three ski areas is available from the bus station next door. Mayrhofen is situated at the end of the Ziller valley railway, which also stops at Kaltenbach and Fügen. The narrow-gauge railway has a regular service to Mayrhofen train station, which is situated within walking distance of one of the main ski lifts. The Ziller valley railway is connected to the main Inn valley services at Strass. Westendorf is one of the Ski Welt resorts with a direct regional rail connection from Innsbruck and Salzburg on the line that also serves Kitzbühel, Kirchberg and St Johann in Tirol. The train station is located a little way outside the centre of the village down on the main road between Hopfgarten and Brixen. As mentioned above, Kitzbühel is served by regular regional train services from Innsbruck and Salzburg althought it is also a stop on some long-distance trains from further afield. Kitzbühel actually has three train stations – the main one is located near the Kitzbüheler Horn cable car down on the main road and another useful one is situated at the bottom of the Hahnenkamm lift. (The third is out at the Schwarzsee lake.) Neighbouring Kirchberg also has its own train station. St Johann in Tirol is another of the ski resort railway stations on the line between the Tyrol and the province of Salzburg and is near the larger SkiWelt, Kitzbühel and Fieberbrunn skiareas. The St Johann train station is located at the base of the Kitzbüheler Horn and so not far from the ski areas on the flanks of the mountain. Fieberbrunn is on the same railway line linking the Tyrol and Salzburg as the resorts above – it is however part of a completely different ski area. Although it is (just) in the Tyrol it has linked to the sizeable Salzburg ski area around the resorts of Saalbach and Hinterglemm. The railway station is a little way outside the town centre, although the ski area is anyway a bus or car ride away from the main town. The rail line also serves another part of the ski area – the town of Leogang over the border in Salzburg. Zell am See is a major rail hub in the Salzburg province. As well as being on the main Tyrol-Salzburg line (as with some of the resorts above) it also has long-distance services which call at the station (for example, to places like Graz, Vienna and Zurich). The train station is situated conveniently for the centre of the town on the lakeshore. 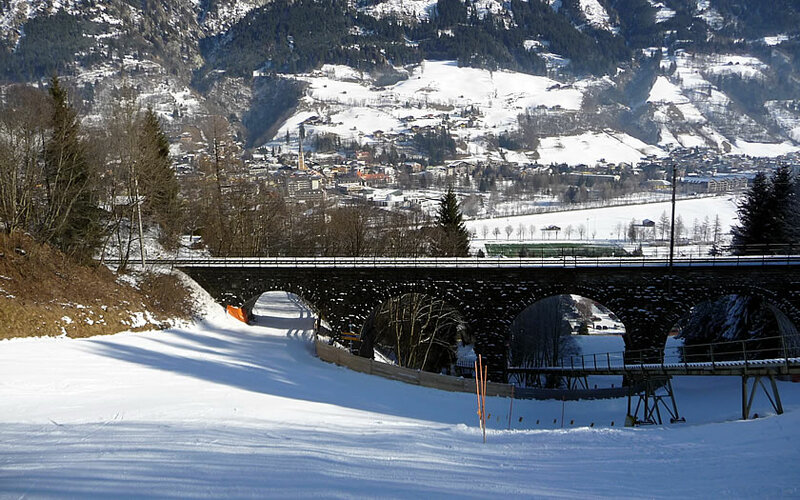 The three ski villages in the Gastein valley – Bad Gastein, Bad Hofgastein and Dorfgastein – are all on a high-speed rail link between the northern and southern side of the Tauern mountains. This means that they have long-distance connections through to places such as Dortmund and Frankfurt in Germany and, possibly along with St Anton in the Tyrol, are some of the most train-friendly ski resorts for good skiers in the Alps. The railway stations at Dorfgastein and Bad Gastein are close to the accommodation, but the one at Bad Hofgastein is some way away from the lifts and the town. The town of Schladming is located in Styria in the south of Austria. It is on a major rail route and, like the Gastein valley above, offers a good range of international connections as well as links to Graz, Salzburg and Innsbruck. The railway station is situated on the edge of town a little way away from the main lifts.